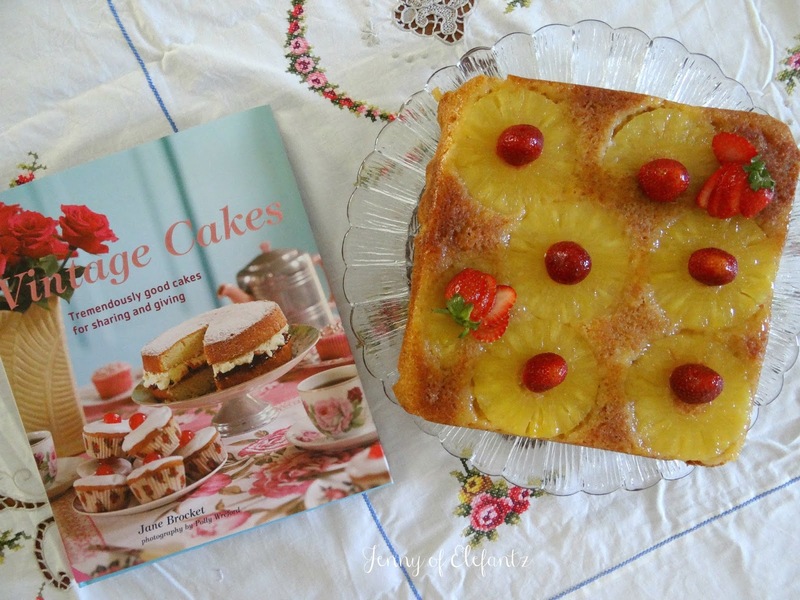 Our section of reading for today’s book study covers two topics – the domestic library and pineapple passion. 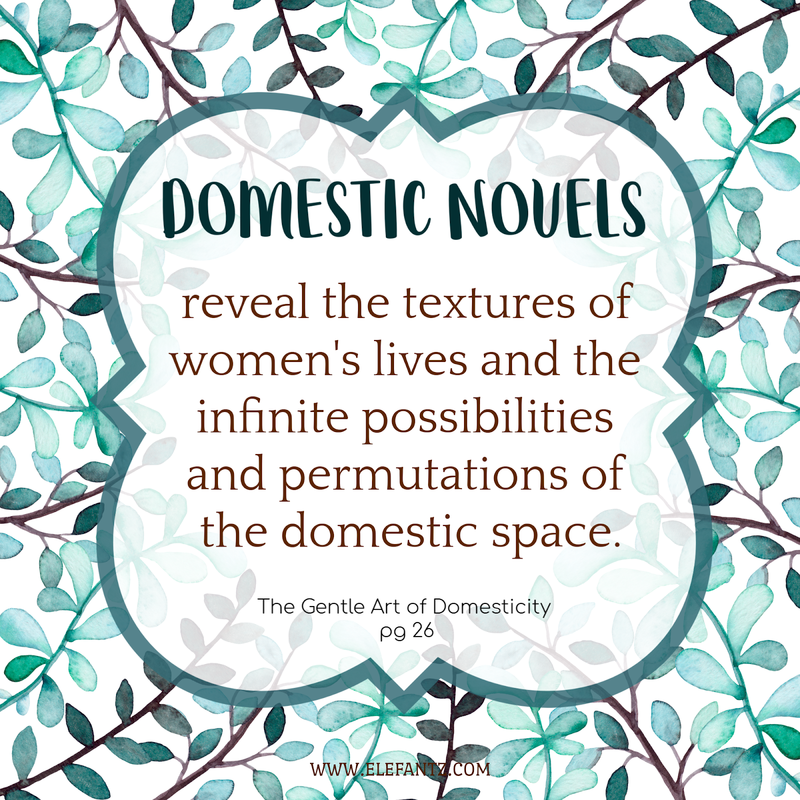 When I first read through The Gentle Art of Domesticity it was 2008 and our day to day home-school life overflowed with books and reading so I found this particular section to be right up my alley. Growing up an only child, the library was my favourite place to be and reading was by far my favourite pastime. I’m sure that long held love of books helped enormously when we chose the ‘living books’ method of home education for our children and just this weekend my sweet Blossom, now almost 25 and a mother of two little girls, called for a chat and shared with me her dearest memories of those years – reading marvellous books together every day. This was joy to my heart you can be sure. So as I share a bit from our book study this week I feel confident in adding my own book titles, the ones which describe aspects of domesticity in such a way that they left an indelible imprint on my life. Jane writes, “Domestic novels reveal the textures of women’s lives and the infinite possibilities and permutations of the domestic space. They also give contemporary women the chance to reflect that we are fortunate in not being compelled to live in that way unless we choose to do so, which makes domesticity a potentially enriching way of life, not a reductive one. “ (page 26). I love this quote, especially “which makes domesticity a potentially enriching way of life, not a reductive one” because from the year I entered high school as an impressionable 12yo women have been fed a menu of misrepresentation about domesticity, homemaking, motherhood and marriage. It was very much advertised as a reductive role. 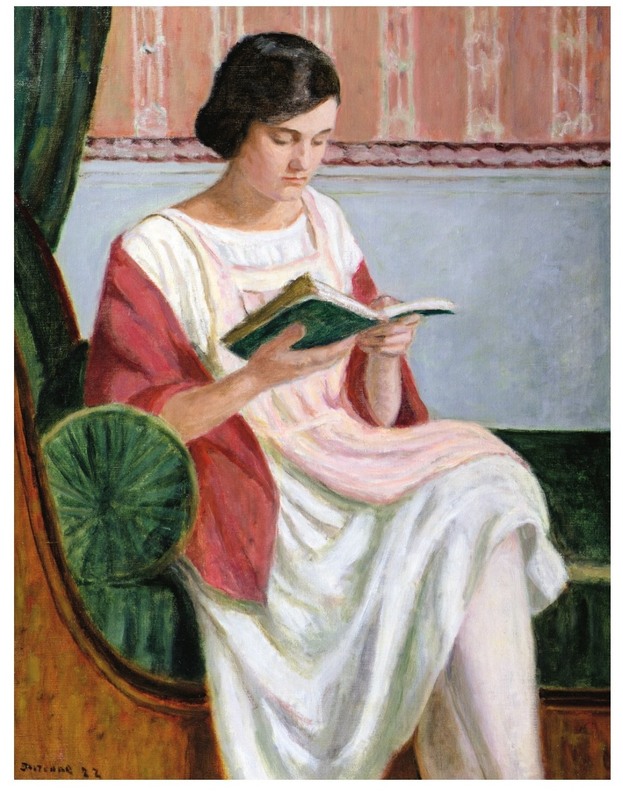 Jane prefers to re-read novels that delight her than to spend time engaged with unknown or possibly disappointing books. Like her I too remember details long after the final page of a wonderful book has been closed and one in particular, which I’ll share later, was read at age 8 and held dear ever since. Domestic novels hold high regard in Jane’s home library and over a few pages she shares what inspired her in some favoured and oft-read titles. “Her imagery is subtle, her understanding of human nature is amazing…she doesn’t moralise, but is deeply ethical.” This book abounds with plenty of knitting, crocuses, ginger puddings and permanent waves. 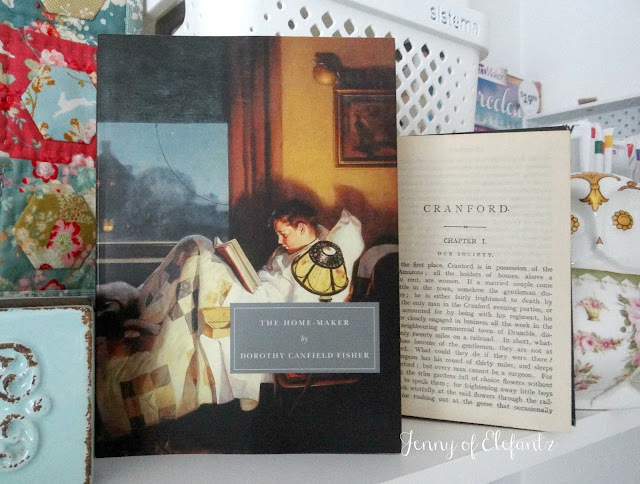 Personally, like Jane, I LOVED The Home-Maker by Dorothy Canfield Fisher and have it out on my table to re-read again. I also loved Cranford and will add that to my reading pile for this year as well. But there’s other books which shall be re-read too, and some of them are from my childhood – What Katy Did is top of that list. I knew I loved her when they picnicked under the trees and ate tarts baked on china saucers because that’s exactly what Nana would bake for me, and so I began to take my tart and picnic under the tree out back and pretend I was Katy. The Little House books by Laura Ingalls Wilder overflow with the most remarkable and genuine domestic scenes, family and parental relationships, using ingenuity, being brave and making do – they stand clear as probably my favourite series of books ever. Running close behind is another book by Dorothy Canfield Fisher, but this one written for a younger audience – Understood Betsy (1916). I will re-read this one during 2019 as well, and noticed just the other day at Blossom’s that her copy was out on the coffee table, obvious that she still enjoys it herself. The main character is Elizabeth Anne (Betsy) and she goes to live in the country to be raised by Aunt Frances. The lessons of living in the country and becoming a very self-assured and confident young girl have you cheering from the sidelines and laughing quite a lot. It was this book which stirred my love for the churn dash block because whenever I see one or make one I am instantly back in the book with Aunt Frances teaching Betsy to make butter in the churn. Books can carve such a strong memory track in your mind that ten, twenty, thirty, forty years later something can trigger a memory and you’re transported back in time to when you read a certain book. Those are wonderful times for me. Jane fell in love with all things pineapple, stemmed originally from the gift of a pineapple during her meagre student years when the expense of acquiring one was prohibitive. To this day she still looks on the pineapple as a symbol of wealth, luxury and romance - which is exactly how it was viewed in the 18th and 19th centuries, and also why so many domestic items from that era featured the humble pineapple. Jane loves pineapple block quilts as well as pineapple crochet and a score of knitting patterns for pineapple blankets and hats. On page 32 Jane shares her own recipe for a Pineapple Upside Down Cake. This inspired me to make one last week, however I used the recipe from another of her wonderful books, “Vintage Cakes” as it was quite unlike the normal way I’ve made these cakes in the past. With no glace cherries in the pantry I added fresh strawberries instead. It was quite delicious, but we decided our original recipe was still a nicer version. How are you enjoying our weekly studies? If you don't have a copy of the book let me assure you that I'm sharing as much as I'm able each week and do hope you're gleaning lots of interesting thoughts and pondering them as they apply to your own life. No matter how many times I've read through the pages and topics of The Gentle Art of Domesticity since 2008, I always find something new to think about and that's probably because each stage of life, all my life experiences, and every journey taken quietly adds alteration to my personality, attitudes, needs and desires. In fact, there's been noticeable changes since we bought our first home and moved in just four months ago. This is what makes the book so special to me - as I grow, it draws my attention to something I'd previously overlooked or not found relevant at the time. What book have you read in the past which still holds an emotional connection for you? In what way? Can you suggest any novels which nurture a 'domestic' culture? Has today's study inspired you to read any of the titles Jane has listed as her read and re-read favourites? If you have missed the previous three weekly study posts they are listed here. May your day be blessed and heart be filled with joy! I loved the Katy books too. I even discovered that after "What Katy Did Next" there are 2 more books - "Clover" and "In the High Valley". They are hard to find, but worth the read. (There is even a movie based on "What Katy Did" although it does differ a bit from the book. It has the same title and stars Megan Follows from Anne of Green Gables). "Jane of Lantern Hill" by L M Montgomery is a good one and another of my favourites. She makes jam, figures out recipes and makes do with what she can find around the house. Thanks Beth for the recommendations, will see if I can get them from the library. Thank you Jenny, I’m really enjoying this series. It so very easy to let the “ gentleness” go from domesticity when we live in a time of “must have” and “must do” and “must buy”. Loved the book list. I agree! Slowing down, observing life through fresh eyes...it's quite a wonderful experience! What a lovely post - thank you Jenny. The books published by Persephone like the Homemaker and Family Roundabout are some of my favourites and I re read them too. Other domestic books are the Emily books by LM Montgomery, Wind in the Willows has beautiful descriptions of Mole and Rattys houses and picnics and The Magic Apple Tree by Susan Hill. I'm loving the fact that out in the wider world there are so many people like you who share the values I hold dear. I have so enjoyed the study. I plan to read/watch all the books/movies she lists whether I've read them before or not. It will be fun seeing them through Jane's eyes. I read What Katy Did and What Katy Did Next but cannot recall much about them. However, I borrowed all the Little House book from the library ( which I also loved to visit as a child) and was totally rapt in them . Ofcourse, when the TV series came along I was even more engrosed as an adult. I have books about Laura Ingalls Wilder herself which I love to look at. It was only in recent years I picked up my daughter's copy of Anne of Green Gables and I have the dvd set. I think I will now add a couple more books to my list. Anne of Green Gables is one of my favorites. My toes curled at all the book titles that are new to me! "An Old Fashioned Girl" comes to mind, but for the life of me, I can't remember the author. I believe there's also a book before it. There's also a series about a young boy who goes to live with 3 male relatives and 1 young female. I found it very domestic & I loved it. It was set in Canada. It's called "Seasons of the Heart." by Janette Oke. I re-read the whole LHotP books every summer or two. The AofGG is on my list for summer. I love to head back to childhood for summer and read all my oldies. I also break out the Nancy Drews! As for an emotional connection, I'd have to say all of them. Living with my gparents was a very safe and cozy time, but books were my primary escape when I lived with my family. I'd climb right in lose myself. I could even be found reading encyclopedias! I devote January to re-reading The Complete Tightwad Gazette and the two Frugal Luxuries books before bed. I'm not finished so I will need February, as well. And then, I'm wasting no time and heading right to the library for one of these. I'll keep the list with me and get as many as I can! 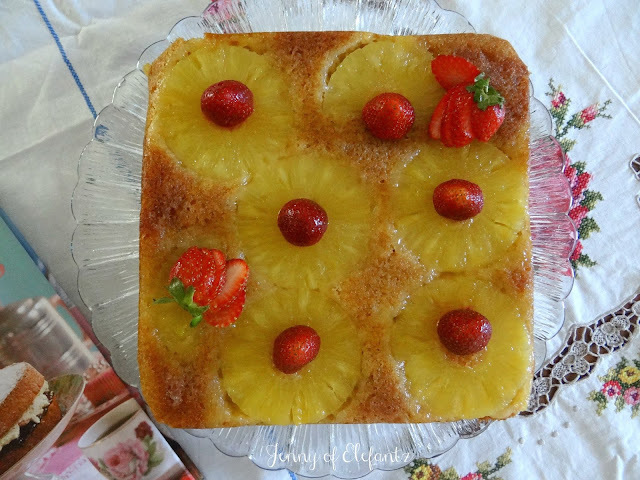 I have always loved pineapple upside down cake & my mom and Gma made it regularly. I never did. When my mom was living here, I woke up one morning and got this overwhelming urge to make one. It was summer, but early so I didn't have to worry so much about heating up the house. I got right to work and it turned out beautifully. My mom loved a sweet with her morning coffee so I took her coffee and piece of cake to her room. She was so excited to see the cake that she clapped! 5 days later, she had a stroke that would lead to her death soon after. I still believe that God gave me that nudge to make that cake. When I saw those mini cakes, I teared up just thinking of how over the moon she'd have been to see one of those! An Old Fashioned Girl is by Louisa May Alcott. I love the Miss Read series about English village life from early to mid 20th century. Also, books by D.E. Stevenson. And Grace Livingston Hill books. I always want to "live" in these books! 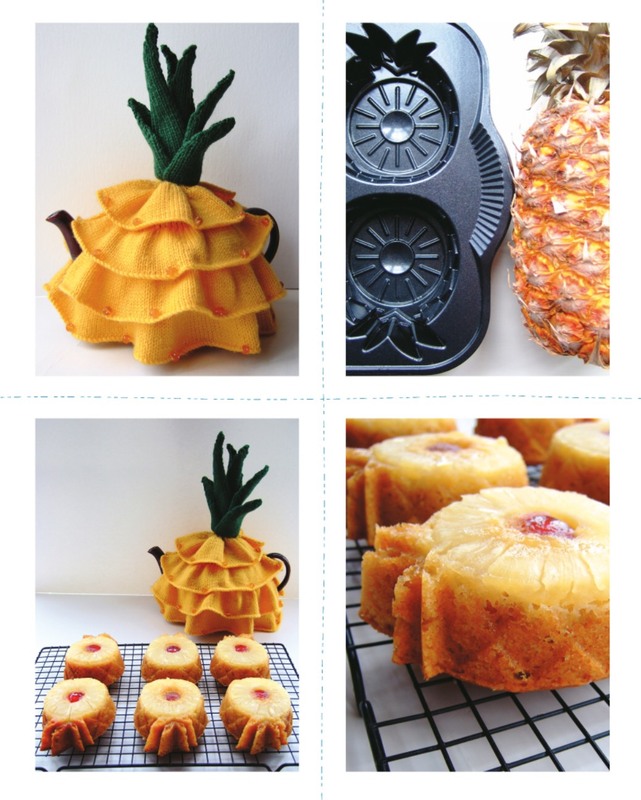 One of the first cake I made in my "teens" was a pineapple upside down cake". Still a favorite. I'm enjoying this book study very much and plan on seeing if my library has Jane's book list. Thanks Jenny. I'm not doing the book study but still enjoy the postings. I love pineapples too. I have 8 oz of juice everyday-tastes better than orange juice to me. I love crocheting pineapple doilies. I was always told the pineapple is a symbol of hospitality. I haven't made an upside pineapple cake in quite sometime. I love that pan that makes individual ones so I may have to put that on my wish list for later. 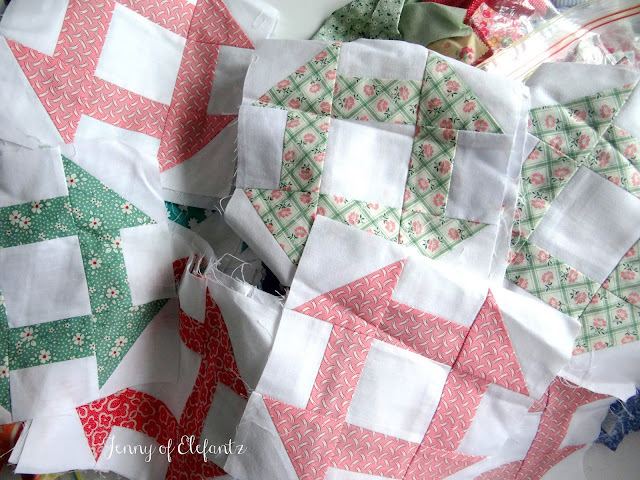 I also have a quilt planned with the pineapple block and then applying some applique pineapples on it. All in delicious citrusy colors...lemon, lime and orange will be the dominant colors because a pineapple can have all those colors in it during different stages of it's development. I know this is off topic but we are bracing for 40 to 50 below zero weather-hate the thought of it. I am trying my best to feed the birds & squirrels but the starlings are taking over. They eat most of the food and are aggressive to the smaller birds. I feel so sorry for them in the winter. Then there's the little feral cat we feed. He's in the shed and was sleeping inside an old milk can I painted. I tucked a little dog bed inside it at the onset of winter. I hope it's enough to keep him from freezing. He won't let us pet him and he runs from us so I can't put him in a cage for the next couple days until it's more of a normal winter weather. I hope he survives okay. They said to wrap up because one can get frostbite on any exposed skin within 5 to 10 minutes. My back is aching from shoveling so much snow this winter. I need a break and everyone being hit by this brutal weather could use prayers. Thank you. Just in.....It's even too cold for ice castles. The Ices Castles outdoor display in Geneva will be closed on Wednesday. Disney on Ice performance at the United Center has also been canceled. My dad's fav cake is the pineapple upside down cake. He will be 95 in 2 weeks so I have everything ready to make him one. He also gets one for Father's day as well. No, I do not know. Can you get a Kindle version in your language?? Check Amazon. thank you Jenny for this post. Reading has always been such an integral part of my life. I picked up an old copy of the faraway tree and have been reading it to my grandchildren. I loved Ann of Green Gables, and Little Women. I named my first dog Heidi! (yes after the book, my favourite at that time!) I have always enjoyed stories of peoples lives and one that stands out is Monica Dickens One pair of Hands. With not much previous experience she takes off for year to become a chef in a big household. I see it was also written in 1939, so that must have a been a good year for writers. I never enjoyed reading domestic novels - I started reading Nancy Drew and Agatha Christie when I was six, and the murder mystery remains a solid favorite today. I do prefer British "cozies", though. The childhood books that stand out in my memory are by Elizabeth Enright - The Melendy Family. Maybe because I was an only child, I loved this family til the books were falling apart, and still love them. Along with Gone-Away Lake and Return to Gone-Away, also by Enright....she has the most profound descriptive writing, you can feel the rain and smell the summer. And Anne of Green Gables, loved those books. I also adored What Katy Did, and had the whole series. I thought I remembered the author's name, googled it, and wow I did, must have made quite an impression, lol!!! Love your churn dash blocks, Jenny! Jenny Dear I am enjoying your weekly reviews of the Gentle Art of Domesticity. 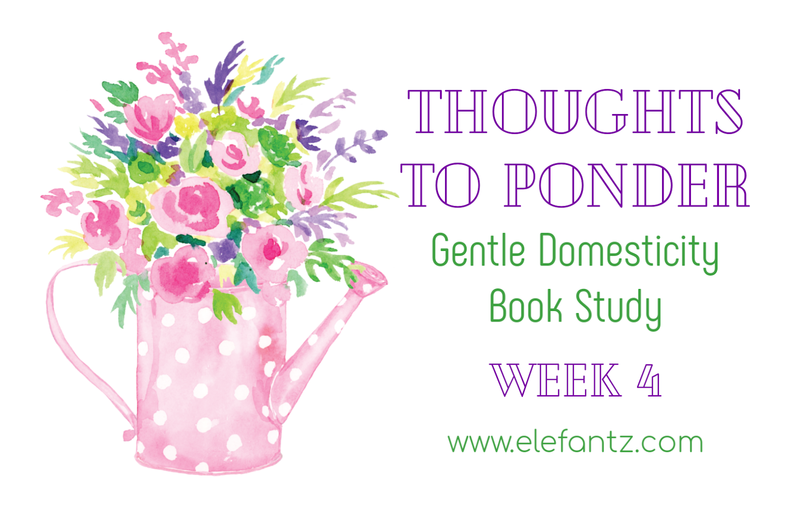 I find a relaxed calm learning how being domestic was annd is not drudgery. I will be checking my local library for these books Jane referenced. I love to read but haven’t done much of it the past several years due to downsizing, relocating by selling our home in CA and buying in Utah. I shall look forward to some calm reading. Blessings Dear Jenny. If you don't mind, as I'm catching up with you all, I'd like to comment on last week. I love the quote "Value the apparently casual domestic moments because you never know what's coming next." It's been a week tomorrow since my mom passed. I wanted to do something for her, a final gift, as I knew her health was rapidly failing, so ten days ago, we had a wicked snowstorm, such that church was cancelled, and so I spent the day sewing a flannel quilt for my mom, not very wide, but plenty long, easy to tuck around her in her wheelchair. I took it to her on the Monday, and sat with her and spoon fed her a bit of supper, played Frank Sinatra music for her, and chatted about this and that, while tacking the quilt. I was so vividly aware, Monday evening, of the comfort of doing this task that so many people have done for their loved ones, tacking a quilt and visiting. Jesus came and took her hand on Thursday, and invited her to go to heaven. We never do know what's coming next, or rather, in this case, exactly when. So to appreciate in the moment is, well, something to treasure. While I have been blessed with many memorable moments with my mother, this one, in the end, is one of my favorites. Lots of good suggestions! I'll add Dandelion Cottage by Carroll Watson Rankin (4 girls makeover a run-down little house). Also the Betsy-Tacy books by Maud Hart Lovelace (8? books which follow Betsy and her friends from youngsters to Betsy's first year of marriage). 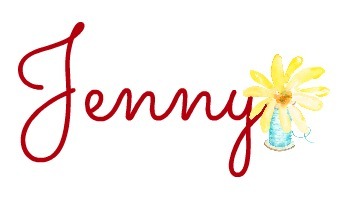 I enjoy your wonderful blog, Jenny, and am praying your house doesn't flood. eventually got my linky up! Week 3 January 30-Feb 5, 2019 Questions to review. 1. What book have you read in the past which still holds an emotional Connection for you and in What way? The Pink Suit by Nicole Mary Kelby. It is about the dressmaker that sewed the Suit that Jacqueline Kennedy wore in Dallas the day that President Kennedy was assassinated. It took me back to that day. It reminds me of how young I was 18 years old and my world changed forever. It reminds me how fast my generation grew up after that event. How our dreams were shattered. It was similar to 911, everything we believed was put in question. Everyone remembers where we were and what we were doing that day in history. We mourned together that Thanksgiving Weekend. I sewed and tailored and I identified with the seamstress that did the manual labor on that suit. Some on famous designed it and she made it come alive with her own hands. The assassination and the aftermath are told through the eyes of a working girl. At the time I was the daughter of a blue color worker getting ready to marry the son of a sharecropper entering the blue collar world. I understand her and she put words to what my generation and class were thinking and experiencing. 2. Can I suggest any novels which nurture a "Domestic Culture"? It is about women in the American west. A pioneer woman, Sarah, and six women, who are called her daughters, face travel by wagon train and frontier life. Rather than a straightforward storyline it is presented as a series of short tales and tableaux represented by a Quilt Square, each presenting an aspect of frontier life or womanhood. The patches or blocks show, "Girlhood, marriage, childbirth, spinsterhood, twisters, fire, loneliness, depression, anxiety, illness and death. The patches are ultimately put together to form one dramatic tableau/quilt. 3. Has today's study inspired you to read any of the titles Jane has listed as her read and reread favorites? Yes, Mrs Miniver by Jan Strutter 1939.